Holiday Titles from KIDS FIRST! TWENTIETH CENTURY FOX HOME ENTERTAINMENT Click to purchase directly from the producer This title has online video! 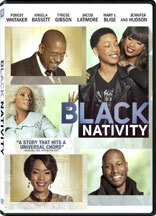 Description - In a contemporary adaptation of Langston Hughes' celebrated play, the holiday musical drama BLACK NATIVITY follows Langston (Jacob Latimore), a street-wise teen from Baltimore raised by a single mother, as he journeys to New York City to spend the Christmas holiday with his estranged relatives Reverend Cornell and Aretha Cobbs (Forest Whitaker and Angela Bassett). Unwilling to live by the imposing Reverend Cobbs' rules, a frustrated Langston is determined to return home to his mother, Naima (Jennifer Hudson). Langston embarks on a surprising and inspirational journey and along with his new friends, and a little divine intervention, he discovers the true meaning of faith, healing, and family. Special Features include deleted scenes, the music behind the film "He Loves Me Still", introductions to the cast and Jacob Latimore, an inspiring playwright Langston Hughes, photo-shoot B-roll, theatrical trailer and more. KIDS FIRST!® Adult Jurors say - This timely film based on Langston Hughes' award-winning play is touching and delivers a great message with a wonderful musical score and performances. Jennifer Hudson is always a joy to listen to and her acting talent continues to grow and expand her range. Her performance alone makes this film worth watching. The musical variety of this film takes many forms from hip hop to blues to gospel. "I would rather be a lamppost in Harlem than the Governor of Georgia" is the famous quote from Langston Hughes who was part of the Harlem Renaissance in the 1920s. His classic play, "Black Nativity", is featured around the country every holiday season. This music version is sure to be a hit with families everywhere as it explores the lives of a young black man and his mother who have fallen on hard times but it leads them both on a spiritual journey. KIDS FIRST!® Kid Jurors say - This is truly an inspirational film and a joy to watch. Langston, played by Jacob Latimore, has to spend the Christmas holiday in New York City with his grandparents, Reverend Cornell Cobbs played by Forest Whitaker and Aretha Cobbs played by Angela Bassett, who he doesn't really know. While there, he has to go by their rules. He wants to get back home to his mother Naima played by Jennifer Hudson. He goes through some things and discovers the true meaning of faith, family and forgiveness. This adaptation of Langston Hughes' play is wonderful. I really like the storyline with its great messages and its attention to detail, even down to the Cobb's family brownstone in Harlem. The acting is powerful and intense and, of course, I love the music. Executive music director, Ralph Saadiq shows his musical talent and has created great songs that tell the story in such a way that both the young and old can listen to and enjoy. I especially like the choir scene. I recommend this film for ages 12 - 17. Of course, I think the whole family will enjoy this movie. I give it 5 out of 5 stars. It's truly a musical event to be enjoyed during the holiday season. JPG, INC. This title has online video! 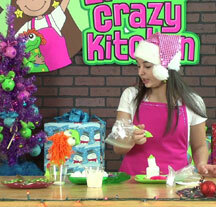 Description - Elena and Razzle create some spooky party treats! On this episode they make skeleton cookies, monster cookies, and ghoul grog. MR. HALLOWEENSTER This title has online video! Description - Mr. Halloweenster is the kids Halloween hero. He's always there to help with costumes, pumpkin carving and everything else that makes Halloween fun. But this time, while Mr. Halloweenster is helping the kids, there's something tricky happening at the JunkVittles Candy factory. Mr. MeanyPants and Dr. JunkVittles are making candy that will make the kids forget about their costumes and the Halloween parade. Only Mr. Halloweenster can save the day! KIDS FIRST!® Adult Jurors say - Mr. Halloweenster is a short, fun cartoon, that tells the story of a town where there are no signs of Halloween, due to a sinister character. Similar to the idea of the Grinch, the bad guy is trying to keep Halloween from happening. Mr. Halloweenster works to bring Halloween back to the children. His attitude is pleasant and upbeat. This is a fun short for children excited about Halloween. Displays problem-solving and an optimistic attitude in the face of negativity. Simple and innocent, the colors are vibrant and the music is upbeat and catchy. KIDS FIRST!® Kid Jurors say - "The kids were not ready for Halloween, but Mr. Halloweenster helped them get costumes." "The villain made candy that would make the kids 'candy-kooky' and not enjoy Halloween." "Mr. Halloweenster steps in to save the day." The kids are glued to the screen and want to watch it again, right away. Appeals mostly to kids under age 7, though everyone watched intently. The younger kids even knew the song and repeated it after. ENTERTAINMENT ONE Click to purchase directly from the producer This title has online video! Description - In this delightful holiday tale, Babar's children write a letter to Father Christmas to ask him to visit Celesteville at Christmas. Their letter never arrives because it is stolen by Babar's arch-enemy, Rataxes the Rhinoceros. He wants all of Santa's toys for himself! Can Babar find Father Christmas and save the day for Celesteville? KIDS FIRST!® Adult Jurors say - Babar is a classic. The story shows kids that Santa Claus is celebrated differently in different cultures. Teaches that being polite and respectful is the best choice and you shouldn't try to cause problems. Also teaches that one should not give up and once you put your mind to doing something, like Babar, you should see it through. Visually it's very old-fashioned, which might not appeal to some kids who are used to more polished animation. 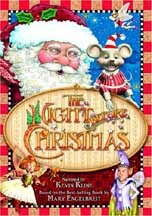 A great holiday classic, fun way to introduce your kids to a vintage movie for the holidays. KIDS FIRST!® Kid Jurors say - This is a cute movie about the beloved elephant King Babar, and his family. Babar's children and cousin Arthur write a letter to Father Christmas asking him to visit Celesteville. Rataxes the sneaky rhinoceros takes the letter out of the mailbox and eats it. 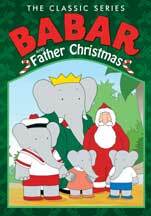 So, Babar decides to try and find Father Christmas so he can personally deliver the message. Does he find him? My favorite characters are Rataxes the rhinoceros, because was just plain silly and he made me laugh, and Babar, because he was determined to find Father Christmas for the children of Celesteville. My favorite scene is Babar in the bathtub having a conversation with the mouse family. They were so cute. I rate this movie 5 out of 5 stars, because there is no violence, and I recommend this movie to everyone. Reviewed by Ny'asia Bell, KIDS FIRST! Film Critic, age 8. ANCHOR BAY ENTERTAINMENT This title has online video! Description - The holidays are coming, and everyone in Wuzzleburg is getting ready for Winter Wonder Wubb Club fun! 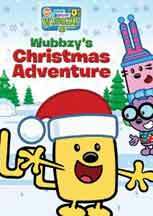 In this all-new Wubbzy collection, everyone's favorite bendy-tailed buddy pitches in to decorate The Figgity-Fig Tree, fix Walden's snow sculpture and even solve the mystery of the Snow Shoo-Shoo! There's plenty of singing, dancing, hoopty-horns and slippery-sledding too, all in the DVD that celebrates the ultimate Wow! Wow! season of caring, sharing and friendship! KIDS FIRST!® Adult Jurors say - What better time is there to show caring and compassion for friends? Holiday time in Wuzzleburg is great fun when you are surrounded by your best buddies. Join Wubbzy and the gang as they build snow sculptures and go sledding. But even in all the fun, as we all know, sometimes things go awry. Even during the holidays. It's up to Wubbzy and his sidekicks, Walden and Daizy and Widget to work together to make things holiday happy. They do this by sharing with each other, reaching out to help others through kind actions and by letting others reach out to help them. Cute songs will have your little ones dancing and singing along. This DVD promotes balanced appreciation of self and others. In a manner suitable for its intended audience. KIDS FIRST!® Kid Jurors say - The adventures with Wubbzy are always fun. I love how Widget always builds something even though something funny happens out of it and it ends out not working like the Snowplower 3000 when a bird pressed a button then the snowman fell. It showed that you can solve things by thinking hard and with some friends to help. It looked and sounded great. It was almost like a play even though it was animated. Someone in a play couldn't do what they do, like bounce on a tail. WARNER BRO. HOME ENTERTAINMENT This title has online video! Description - This hilarious Christmas film tells the tale of a young orphan child who mistakenly crawls into Santa's bag of gifts on Christmas Eve and is transported back to the North Pole and raised as an elf. 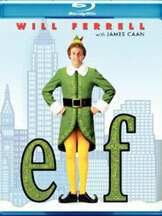 Years later, Buddy learns he is not really an elf and goes on a journey to New York City to find his true identity. Starring Will Ferrell, James Caan, Bob Newhart, Mary Steenburgen and Zooey Deschanel. KIDS FIRST!® Adult Jurors say - Definitely a new twist on Santa. A human baby mistakenly grows up amidst the elf community of Santa's North Pole. He realizes he is different - nearly 3 times the height of the other elves and doesn't fit into his own bed. When he discovers he is human, he sets out (on foot) to find his roots. Buddy is sweet, loveable, and very naive. Will Ferrell's portrayal wins your heart, especially if you are a child. KIDS FIRST!® Kid Jurors say - Elf is the story of a human named Buddy who was raised by elves in the North Pole at Santa's Workshop. When Buddy becomes an adult, he is told that he was adopted so he goes on a quest to find his father in New York City. This movie is hilarious. Will Ferrell is perfect for the role of buddy! He really portrays the character's sweetness with a comedic touch. One of the reasons I love this film so much is that it really captures what it would be like to take someone who has lived in fantasy land and throw them into the hustle and bustle of the big city. There are several montages throughout the film. My favorite would have to be when Buddy comes to New York for the first time because he does such bizarre things. If I were to see him eating the gum of the hand rail or playing in a revolving door in my town, I would think he was crazy! I end up feeling bad for Buddy because he is so clueless to how the real world works. Another thing that makes this movie so hysterical is that in the North Pole the props, costumes, sets and back drop are so elementary and simple, it really accentuates the innocence and comical quality of the elf world. Also, in the North Pole, there are some animals made of clay animation. Their design is very similar to the old Rudolph the Red Nosed Reindeer movie, and that warms my heart and makes me laugh. This movie is perfect for family night, watching with friends or when you just need a laugh. This story is touching yet funny as Buddy goes on an amazing journey to get closer to his father's heart and bring back holiday spirit to all. This is a great film for all ages because it contains the fun innocence of an elf that children can enjoy and it also has a bit of adult humor for the older viewers. Although young children will love this movie, I think ages 7 and younger should watch this with an adult or older child because they may get slightly confused or frightened. Over all, this is a wonderful film, whether it's the holidays or not. Description - When a doubting young boy takes an extraordinary train ride to the North Pole, he embarks on a journey of self-discovery that shows him that the wonder of life never fades for those who believe. Based on the book by Chris Van Allsburg. KIDS FIRST!® Adult Jurors say - This book-based film is so extraordinary and remarkable, I don't know where to start. First off, the images are not only true to the book, but the most realistic animation I've ever seen. The use of motion-capture technology to turn actual actors into animated characters is nothing short of fantastic, giving the character an almost life-like quality. Their facial expressions and body movement leads you into thinking they are real. The moving train scenes almost make you dizzy at times. Most important, is the core story by Chris Van Allsburg that winds its way into your heart. The book always comes out at Holiday time at my house and now, so will the DVD. KIDS FIRST!® Kid Jurors say - The beautiful "The Polar Express" film is based off of Chris Van Allsburg's book. When I was little, I loved reading "The Polar Express!" It's definitely a holiday classic. "The Polar Express" film is about a boy who starts to believe that Santa isn't real, when the magical Polar Express comes to his front door and picks him up to go to the North Pole. Along the way, the boy makes friends with other kids on the Polar Express and slowly realizes that the Christmas spirit will always lie in his heart. The film, like the book, captures the Christmas magic and everything Christmas represents. My favorite part of the film is when the boy runs outside in his pajamas to the magical Polar Express at the beginning of the film. The train is so believable and the sounds are very much the sounds of a real train! It's a very magical scene! All the artwork and animation is beautifully detailed. I love the rich colors that were chosen for this film. The music is also very powerful and made me feel the Christmas spirit throughout the movie. My favorite thing about this entire film is that it's original. "The Polar Express" reminds me of nothing I have ever seen before. I believe that this is a great family film. "The Polar Express" is on DVD and all ages can watch this, although I think for kids eight and under, it might be difficult for them to catch everything the first time seeing it. However, everyone will enjoy and catch the magic of "The Polar Express." Description - An animated holiday special featuring the voices of Danny Devito, Lucy Liu, NBC anchor Brian Williams and Disney Channel star Brenda Song about a boy who reluctantly moves to Manhattan only to lose his dog in Central Park on his first day. Description - Two brothers the oldest with Down's syndrome journey out to find Santa and prove his existence. Santa and some elves follow along in disguise keeping the boys safe and on the road to find answers to a number of other equally important questions. KIDS FIRST!® Adult Jurors say - Great story, very professional, great message. Santa is definitely a topic kids love to talk about. The brothers go on a rather monumental journey and meet some wonderful people along the way. The way they interact with each and those they meet is a great example to all of us. The fact that the brothers go looking for Santa is an adventure that many kids can relate to and wish they could do it as well. What is most enjoyable is allowing the child with disabilities to behave normally. There are definitely some moments that the kids behave slightly dangerously but are overshadowed by the positive theme of the film. KIDS FIRST!® Kid Jurors say - Kids absolutely loved this movie. Great for Christmas or for any time of year. "This is a good movie. The boys went on a cool trip." "The boys meet a lot of different people on their trip - lots of people might think they are scary but they were nice to the two brothers." 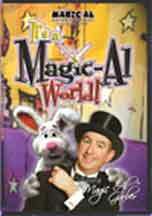 Description - When Grandpa Magic Lou, owner of Magical World Shop falls ill, Al must go run his shop. But Al has only one day to learn magic and save the store from closing forever. With a little help, Al finds the Shop is a magical place and becomes Magic-Al. KIDS FIRST!® Adult Jurors say - Good combination of magic and comedy. Lovely film that is educational as well as interesting. The slight story of how Magical Al became a magician holds the show together and takes it to another level. He does a good job to involve children in the show as volunteers. Each segment is brief and upbeat. Not a high budget production but it works. The tricks are well done , the story flows and it's appropriate for kids. Might motivate kids to check out magic books or how to DVDs. KIDS FIRST!® Kid Jurors say - Enjoyed by all. Held their interest for the entire film. "It's really good and really funny." "My friends would like it because it is so funny and they would like the magic." "I related to it because I like to do magic myself." "I liked how people became cartoons." "When the butterfly came across, the sparks were cool." The kids tried to figure out how to do the magic tricks and talked about similar tricks they saw in a live magic show. "I would watch it 5 times if my mom would let me." Description - Features four original holiday songs, plus Rudolph the Red Nosed Reindeer in the traditional style and the popular schoolyard style. 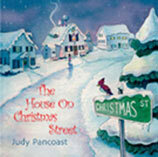 Includes a Christmas tale written and narrated by Judy Pancoast. KIDS FIRST!® Adult Jurors say - Engaging and entertaining for both adults and children. Helps develop good decision making and planning skills. Promotes admiration and love of family and friends. Emphasis on social skills such as accepting others, not teasing, respecting others, making and keeping friends and helping others. Catchy, upbeat music. Professional music quality. KIDS FIRST!® Kid Jurors say - Kids enjoyed the story and the music. They laughed and sang along. "I really liked it, especially the story, the pickle song, and the Rudolph song." "It shows us that we should help one another." "I really liked the story about the little tree, Freddie, because he was so happy when he finally got to be in someone's house for Christmas." Description - Inspired by her best-selling book, beloved artist Mary Engelbreit brings Clement C. Moore's classic alive in brilliant CGI animation. KIDS FIRST!® Adult Jurors say - Sweet, funny and smart. Very professional production with worthwhile bonuses. Quality 3-D animation. Terrific sound. Expands a short story into an imaginative adventure that can be confusing. Strong message of consideration, remorse and forgiveness. KIDS FIRST!® Kid Jurors say - Joyfully danced and sang along to the songs in the story and in the "Sing Along" section. Loved seeing Santa and fairies. Asked a lot of questions. Some didn't understand the force field and other sequences. "Do fairies live in mushrooms?" Description - When Captain Salty and Milo discover a stowaway onboard their ship, they set out to find Kiki the kitten a new home. The adventure continues when she boards the Alphabet Express with Paddy and Bobo who help her to imagine new places to live. She befriends Jenny who delivers her to a new home on the farm. KIDS FIRST!® Adult Jurors say - Simple linear story line puts a lot of educational information - transportation, numbers, animal sounds, shape, and senses - into a small space. Soft, bright colors and basic shapes inspire imaginative thinking. Appealing three-dimensionality. Music is lively and not too overwhelming. KIDS FIRST!® Kid Jurors say - Seemed happy and attentive while watching it. "I like the kitty!" "I like the Moo-moo! Moo-moos eat hay!" Enjoyed the rhythm. There was a lot of head-nodding and hand-clapping to the beat and lots of moo-moo-moos. One child asked to watch it everyday, and everyone watched without getting bored. Description - Starring the ever-popular Billy Blazes and Wendy Waters' as an elite team of rescue personnel who combine their individual strengths to respond to emergencies around the world, the movie shares positive life lessons about teamwork. KIDS FIRST!® Adult Jurors say - Good concept - superheroes without physical violence. At times, confusing situations and words. Also a bit long. The natural disasters and decisions made are best understood by older kids. Good talking points - like seatbelts. Good role models. KIDS FIRST!® Kid Jurors say - Awesome. Cool. "It's unrealistic but it is a cartoon." "I loved the earthquake rescue." "I love their gadgets and the fast truck." "They are always there for each other." "I was wondering, don't volcanoes have toxic fumes? Why is an avalanche dangerous?" Description - Animated adaptation of the best-selling book, The Legend of the Candy Cane, where the story of the hidden meaning of Christmas candy is revealed. KIDS FIRST!® Adult Jurors say - Entertaining, high quality animation and music, fast pace, and engaging characters. Simple lesson to all: help others and share what you have. Shows that happiness can come even in the frame of a sad town. Good problem solving themes. KIDS FIRST!® Kid Jurors say - Great! Promotes love of families and neighbors. Kids liked the funny parts with the animals and that it's about a candy cane. "The animals are funny." "I liked the singing and the songs." "I liked learning about the candy cane." Description - Inspired by the grand tradition of Gilbert & Sullivan's legendary musicals, this unique take on a simple story delivers the true meaning of Christmas. Includes: The Toy That Saved Christmas. KIDS FIRST!® Adult Jurors say - Fresh, clean, entertaining story for the holidays and beyond. Catchy music, appealing visuals, quality sound, funny. Tells the true meaning of Christmas; shows that people are still people even if they have done wrong. KIDS FIRST!® Kid Jurors say - Kids enjoyed the story and tapped their feet along with the music. "It made me think about the story of Christmas, forgiveness and being nice to people." "It talked about friendship and showed God's love and forgiveness." "It shows people helping." This title is available for purchase from BIG IDEA PRODUCTIONS, INC. Description - Clement Clark Moore's timeless tale, told by Anthony Edwards, is at the heart of this collection of holiday stories. Also includes "Max's Christmas" and "Morris's Disappearing Bag" by Rosemary Wells and "Owl Moon" by Caldecott Medalist author Jane Yolen. KIDS FIRST!® Adult Jurors say - Wonderful anthology of warm-hearted holiday favorites each with a family theme. Narrated by popular actors. Simple and easy to understand for young children. Vocabulary is age-appropriate. Easily viewed in segments. KIDS FIRST!® Kid Jurors say - Children enjoyed having stories they recognized read to them. "They had a nice family and Max is really cute." "I want to see them disappear again." Children talked about what it would be like to see Santa Claus, or to have a "disappearing bag". Description - The legendary Batman and Robin join forces with Scooby Doo and the gang to foil a counterfeiting scheme hatched by The Joker and The Penguin. When the super criminals return to steal a flying suit the dynamic gang prove that friendship can save the day. KIDS FIRST!® Adult Jurors say - Mysteries with a twist of humor, silly antics, and a few spooky spoofs are trademarks of Scooby Doo. Mix in a familiar super hero and you've got a funny story, familiar characters, a message that crime doesn't pay, and a demonstration of good teamwork. KIDS FIRST!® Kid Jurors say - Appealing. "I like the mysteries they solve." "Sometimes it's scary and I like that." "I like these Batman and Robin better than the new ones." "Batman and Robin are my favorite superheroes because they are smart but don't have special powers." Description - The kids from the TV series, Recess, convince their Third Street Elementary School teachers that miracles really do happen at this special time of year: Principal Prickly, Miss Finster and Miss Grotke conclude that the kids are naughty...but nice, too. KIDS FIRST!® Adult Jurors say - Fun holiday comedy. Good sound, consistent graphics and believable characters. Good racial diversity and both genders fairly represented. Not all behaviors are positive: "Shows kids having fun, growing up, and freely being naughty and nice." KIDS FIRST!® Kid Jurors say - Loved it. Definitely wanted to watch it again. "It's pretty funny." "It had all kinds of kids, like our school. We liked that!" "I wouldn't like going to that school though. The teachers were mean sometimes." "I liked how it came out good in the end." Description - More than anything, nine-year-old Ralphie Parker wants a "Genuine Red Ryder Carbine Action Two Hundred Shot Lightning Loader Range Model Air Rifle." Standing between him and the gift of his dreams are two parents opposed to his acquiring a rifle. KIDS FIRST!® Adult Jurors say - This is a movie everyone can relate to; our recommendation is for ages 10 and up. The boy's situation is timeless and captures the essence of childhood in the 1940s or 50s. It raises issues about peer pressure, especially among young boys. The quirky family members are easy to relate to. It is based on the autobiographical novel, "In God We Trust, All Others Pay Cash," by Jean Shepherd who also narrates the film as the adult Ralphie. Be forewarned, it contains some strong language, some mild aggression and the idea of promoting a gun as a gift may be troubling in today's culture. KIDS FIRST!® Kid Jurors say - Provocative, especially among boys. Many felt their parents would act the same if they asked for a gun. The 1940s setting evoked discussion about different values and points of view. Long. Inappropriate for younger kids. Description - Santa is feeling forgotten by the children of the world, and decides to skip his gift-giving journey and take a vacation. But Mrs. Claus, two elves and a magical snowfall awaken the holiday spirit in the kids hearts to make Santa change his mind. KIDS FIRST!® Adult Jurors say - Gentle and imaginative. Animated doll-like characters capture the magical spirit of Christmas and add to the traditional holiday experience. Helps kids to examine their values and beliefs and to appreciate the work others do. KIDS FIRST!® Kid Jurors say - Loved it. "I love hearing stories about Santa." "I wanted to help Santa give out toys." Sang the songs and asked to watch it again after a second viewing. "We loved everything...the elves, nice Mrs. Claus, and the songs." Description - When his beloved Grandma appears to be missing on Christmas Eve, young Jake goes on a wild adventure to try to prove that Santa is real. But first he must outmaneuver his curvy cousin and Austin Bucks, a powerful businessman. KIDS FIRST!® Adult Jurors say - Funny and entertaining. Warm story reflected in cozy scenes and softly colored animation. Good family interactions: Jake has a special bond with his grandparents and accepts his conniving cousin. The "bad guy" businessman turns out to be not so bad. KIDS FIRST!® Kid Jurors say - Enjoyed the holiday theme. "We really liked this video, especially since we got to see it at Christmas." "People treated each other well, except the nasty cousin who just wanted all of Grandma's money. Everyone else acted as a team." Description - It's Christmas Eve and Santa is stuck at the North Pole with a sprained ankle. Now Fred and Barney have to save the holiday - except Fred has promised his boss he will play Santa at the Children's Party. Can he deliver all the toys in time? KIDS FIRST!® Adult Jurors say - Calm and simple comedy. Appealing older cartoon with bright colors and good sound. Delightful Christmas message about hope and perseverance, and helping others for a good cause. Great for kids who believe in Santa Claus. KIDS FIRST!® Kid Jurors say - Enjoyed the new-to-them holiday story. "It was funny." "Barney and Fred were trying to help Santa so the holiday wouldn't be bad for the boys and girls." "Those kids were really bratty, I don't think they should get presents." "It looked good." Description - Robbie is a bit lazy, a bit chubby and totally lovesick. He's not sure where he's going in life and is soon convinced he's hopelessly unfit to join Santa's sleigh team. But in his fun adventure, he learns that hard work and talent do get rewarded. KIDS FIRST!® Adult Jurors say - Hip holiday fare for older kids. Fabulous claymation, great color and sound. Amusing, expressive characters and sophisticated dialog. Clever, modern take on Santa with some sexual innuendoes and some drinking. KIDS FIRST!® Kid Jurors say - Kept their attention and made them laugh out loud. "It was cool. I liked the clay people." "I liked the house that kept sliding down the hill." "The heater on the snowman was kind of creepy." They all liked the score-keeping at the Reindeer Games. Description - Barbie magically comes to life through stunning computer animation in this modern adaptation of the E.T.A. Hoffman classic. The tale is enhanced with dance scenes produced with special animated effects. KIDS FIRST!® Adult Jurors say - Wonderful production of a timeless story, beautifully crafted. Striking and fluid animation. Excellent music. Perfect for aspiring dancers, a little scary for youngest viewers. Identification with Barbie, the doll, is understated. "A holiday classic." KIDS FIRST!® Kid Jurors say - They were glued to it, even boys. Many kids were dancing by the end of the tape. "We liked the adventure and that is was Barbie." "It was not what we expected." They easily followed the story: "It taught me to accept people the way they are." Description - The holidays get a different spin when Santa is thrown from his sleigh during a storm, suffers from amnesia, and gets drafted to be a department store Santa. KIDS FIRST!® Adult Jurors say - Funny, modern holiday story with a serious undertone that helps viewers contemplate how well they listen to others. Well produced, good diversity. Some unsafe behavior is shown and a single mom tries to hide her boyfriend's overnight stay from her son. KIDS FIRST!® Kid Jurors say - Funny. "It made me laugh, but it had a little too much romance." They didn't like the mean-spiritedness portrayed, especially by the elves. "It had some naughty talk, some nice talk." "We liked how the boy knew it was the real Santa. Description - Offers three Halloween stories including: "Legend of Spookie Ookie" with Pappy tricking Zowie and Olie; "Ooh Scary," where the 'bots share laughs in a frightening fun house; and "Zowie, Queen of the Pumpkins," where Ookie reveals what he really wants. KIDS FIRST!® Adult Jurors say - Thoroughly enjoyable. Simple shapes, bold colors and secure family setting help youngsters understand that it is fun to be scared, and Halloween is all pretend. Action is centered around the family celebrating together. "No tricks here - what a treat!" KIDS FIRST!® Kid Jurors say - Laughed, squealed and asked repeatedly to watch it again. "Spookie Ookie was scary, but the baby wasn't afraid." "Rolie was trying to scare Zowie but he got scared instead. That was funny." "The brother and sister protected each other." "I'm not scared." Description - Theodor "Dr. Suess" Geisel's beloved and imaginative story about the green curmudgeon who tries to steal Christmas from Whoville is brought to life with live actors in fantastic sets and costumes. KIDS FIRST!® Adult Jurors say - Expertly crafted production with great music, costumes, scenery and cinematography. This classic Christmas story has built-in meanness by the Grinch counterbalanced by Cindy Lou Who - who has her own doubts about Christmas. The sets and costumes are outstanding, the Grinch funny and scary all at once. Ultimately it delivers a little magic that places it right in with other holiday favorites. Contains some crude humor. KIDS FIRST!® Kid Jurors say - Some laughed, booed and cheered. "It was funny and creative." Others' responses were more tepid. "It's like big time fiction. My little brother might think it was real, and he would probably cry." "Christmas is not what it showed. I mean, come on." Description - Join the "friendliest ghost you know" for this and six other high-spirited afterlife antics: Love at First Fright, The Impossible Scream, Something's Fishy, Space Circus, Prehistoric Hi-Jinx, and Count Fatula. KIDS FIRST!® Adult Jurors say - Light hearted Halloween entertainment. Casper, the quintessential good guy, sets a good example, but is persecuted by the other ghosts for it. Some trick-or-treat safety issues and unflattering portrayal of police. Somewhat outdated visually . KIDS FIRST!® Kid Jurors say - Most found Casper irresistible and appreciated his friendliness. "He is nice. He is good at making friends. The other ghosts were trouble makers." "Do they treat people right? Uhhh...do ghosts count as people?" "Can I just watch one story at a time?" CLASSIC SCOOBY DOO "WHICH WITCH IS WHICH?" Description - Two Scooby episodes are featured together: In "Which Witch? ", Scooby and the gang meet what appear to be a gruesome zombie and a witch in the swamp. "Nowhere to Hyde" Scooby-fies Edgar Allen Poe's classic story of Dr. Jekyll and Mr. Hyde. KIDS FIRST!® Adult Jurors say - Fun and not too scary. Good 70s animation and sound. Mysteries and clues challenge kids to look beyond the obvious. Teamwork is shown, and girls are strong characters. Shows some unsafe behavior that's inappropriate for younger viewers. KIDS FIRST!® Kid Jurors say - Completely entertained them: they watched it twice in a row. "It was really fun to watch." "It shows boys and girls working together. They help each other out if one of them gets in trouble." "The music was cool. So nice." "I knew it wasn't a witch." Description - Danny is shocked to learn that the town he just moved to is unable to celebrate Halloween due to a local curse. With the aid of his recently deceased (but still kicking) uncle, Danny battles an army of ghouls to break the curse. KIDS FIRST!® Adult Jurors say - Spooky Halloween story that's funny and exciting but not too scary. Imaginative effects and makeup. Positive, nurturing relationship between Danny and his grandfather helps him when his father is absent. Zombies emerging from the grave could offend some. KIDS FIRST!® Kid Jurors say - No wandering attention on this one. Made the kids think about the behaviors they see every day - such as bullying - in a new light. Saw that superstition and prejudice could adversely affect their lives. "Very interesting." "It was like a costume party." Description - Bear and his friends learn about the various winter holidays: Christmas, Chanukah, Kwanzaa and Winterberry. After helping a homeless dog find a home, Bear and his friends learn that there is more to the holidays than receiving presents. KIDS FIRST!® Adult Jurors say - First-rate production, quality couldn't be better. Playful way of teaching children about sharing and helping. Homelessness is gently broached with a homeless dog that Bear kindly brings into the house. Sends a subtle message of diversity and good will. KIDS FIRST!® Kid Jurors say - "I love the big Bear!" "It was so nice to see how Bear helped that dog and the dog got his wish and found a home to live in." "Bear made us think about helping others during Christmas, that it's better to give." "I would like to see a Kwanzaa." Description - Bear and his friends discover dressing up in costumes and trick-or-treating for Halloween. Then, everyone comes together to create a Thanksgiving Day meal and pageant for friends. They sing many songs and learn how fun it is to celebrate their blessings. KIDS FIRST!® Adult Jurors say - Colorful, enriching, exciting presentation. Wouldn't any parent want Bear as a substitute caregiver? Original and creative, nothing is being copied here. Characters are great friends for any young viewers. "I think I may enjoy it as much as the children." KIDS FIRST!® Kid Jurors say - Awesome! "We like Bear." "I like it when Bear smells." "I like the songs and characters." "We want to make our own pumpkins and decorate for Thanksgiving." "I learned about Thanksgiving. I'm going to tell the story next Thanksgiving." Description - Based on the novel by Jerry Bledsoe and set in small-town North Carolina in 1950, during the height of the polio epidemic. 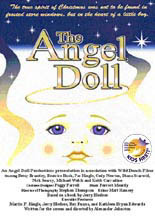 Two boys set out to get an angel doll for one of their sisters and find the true meaning of Christmas. KIDS FIRST!® Adult Jurors say - Well produced, great story line, full of emotion, poignant ending. Main characters exhibit strong moral character. Christianity is respected. Except for a questionable scene with boys checking out a woman's bosom, great family movie. KIDS FIRST!® Kid Jurors say - Favorable responses with strong reactions to the mature themes. "It moved along, not fast or slow, but just right to keep you interested." "It was sad for me to watch some parts." "It made us realize how lucky we are." "Looked like real life." Description - An off-beat and sweet holiday feature from Matt Groening, creator of the "Simpsons." Olive is an adorable little dog who misunderstands a radio broadcast about Santa canceling his Christmas trip due to an injured reindeer. She jumps at the chance to help Santa but meets characters both helpful and mean along the way. Description - Watch as the perfect Christmas tree is found by helicopter for the Rockefeller Center Tree Lighting Celebration. Gives the history about Christmas trees and visits a Christmas tree farm. KIDS FIRST!® Adult Jurors say - Well done, flows easily, offers facts in age-appropriate fashion. Concepts are both explained and demonstrated. Historical information is about trees, not the meaning of Christmas. "Personally, the focus on finding a perfect tree seems superficial." KIDS FIRST!® Kid Jurors say - Captured kids' attention. They enjoyed learning about the Rockefeller tree and sang along to Christmas songs. They appreciated the child narrator. "I liked the people in the video." "The pictures made the story more clear." Description - Mary-Kate and Ashley's Christmas Odyssey involves two light-hearted crooks who claim to be Santa's elves, a ransom demand, a mother's love, a million-dollar lottery ticket and a would-be Santa and his reindeer. KIDS FIRST!® Adult Jurors say - Cute, simple, at times thought-provoking. Filled with slapstick humor. The criminals are too nice. The stunts appeal to this age group. Lacks cultural diversity and has some profanity. Poor role models such as running away and stealing money. KIDS FIRST!® Kid Jurors say - Loved silly, slapstick humor. The twins are endearing to children, their adventures compelling. Even boys liked this one. "I liked when they smashed their piggy banks." "Running away isn't good." "I could watch it a million times." Description - The sly sleuths are busy wrapping holiday gifts and learning carols when a call from the Three Wise Men sends them in search of the Spirit of Christmas. KIDS FIRST!® Adult Jurors say - Promotes the spirit of giving and love. Characters are polite, helpful, accepting of others and practice good manners. Both fantasy and realism used to entertain and inform. The lack of supervision for the girls concerned some adult jurors. KIDS FIRST!® Kid Jurors say - Kids sang the songs long after viewing. Brevity of the video works well for this age group. Inspired their interest in mysteries. Kids discussed the safety issues and the vocabulary they didn't know. "I would like to be a detective and solve mysteries." Description - You're invited to join the twins as they ring in the Yuletide with style. KIDS FIRST!® Adult Jurors say - Delightful. Presents Christmas as a time for love and joy. Shows positive results when friends help each other and promotes family traditions. Some felt it lacked substance and the girls' behavior was stereotypical. KIDS FIRST!® Kid Jurors say - Enjoyed watching the twins ski and play in the snow. They sang along to the songs. Prompted a discussion about family Christmas vacations. All the kids wanted to bake cookies afterwards. "The best part: seeing Santa as the delivery man." Description - Charlie, Itchy and Sasha star in a canine version of the classic Charles Dickens' Christmas tale. When Carface the bulldog devises a corrupt plan to ruin Christmas, Charlie and his pals visit him as the ghosts of Christmas past, present and future. KIDS FIRST!® Adult Jurors say - Promotes Christmas spirit; good things come if we hold fast. Stresses good will toward others. Interesting spin on the classic story. Characters inspire compassion for animals. Adults objected to the zombie scene where they put a spell on the dogs. KIDS FIRST!® Kid Jurors say - Great heroes, funny adventure. Enjoyed watching Charlie dance in the yellow suit and listening to the other dogs sing. "I like the magical things they do with cartoons." "Most characters behaved, some needed to learn to be nice." Description - It looks like the worst Christmas ever until brave little Buzz-Saw Louie doll takes matters into his own hands. 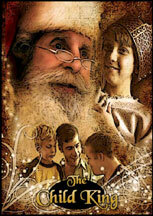 Teaches children messages about the true meaning of Christmas. KIDS FIRST!® Adult Jurors say - Offers easy-to-understand message about the value of giving. Lessons employ positive role models. Encourages problem-solving. Animation is unique and inviting. Contains some stereotyping. Christian overtones. KIDS FIRST!® Kid Jurors say - Sang along with the songs and found the animation inviting. "At first I was sad when I thought Christmas would be ruined, but then I was happy when the penguins and the toy saved Christmas." "I liked the song about 'It's okay to be different.'" Description - This animated adaptation of Grimms fairy tale features an outcast duckling who wishes to find a place to belong. KIDS FIRST!® Adult Jurors say - Good story for a child expecting a new sibling. Has a happy ending and it's full of sad, joyful, and angry emotions. Raises issues of homelessness, loneliness, friendship, difference, and family. Encourages one to be nice to all people and animals. KIDS FIRST!® Kid Jurors say - Everyone watched this twice. They loved the happy ending. Kids empathized with the ugly duckling and the girl with the same wish. "You shouldn't run away from home." "It teaches you not to be mean." "It was sad in parts." Description - In the dark days of Roman persecution, Christian storykeeper, Ben the Baker, and his friends spread the tale of Easter and of Jesus' death and resurrection. This action-packed story teaches faith, family values and the history of Easter. KIDS FIRST!® Adult Jurors say - Raises good philosophical questions and moral dilemmas. Usefulness as history depends on the viewer's religious beliefs. Includes an oddly accented African family. Contains some violence, such as scenes of Rome burning, attacking people, crucifixion. KIDS FIRST!® Kid Jurors say - Kids were enthralled and full of questions about the Romans and the Christians. Provides a discussion-starter for moral issues without being preachy. "It showed us how to be good." Their favorite part was Jesus rising from the dead. Description - Allegra learns the true meaning of Christmas giving when she finds out that one of Santa's helpers expects to spend Christmas alone. Allegra to the rescue! KIDS FIRST!® Adult Jurors say - Colorful characters. Engaging, thoughtful story. Wonderfully instructive in showing how to be happy about simple things. Good message about giving. Good color and amusing puppets. Appropriate language. Pace and visuals at times too fast. KIDS FIRST!® Kid Jurors say - A nice Christmas message for kids. Prompted discussion among kids afterwards. Allegra is very lovable. The children sang along and laughed and talked about what they saw. Some dialog scenes are somewhat long. Description - A father is desperate to buy his son that "must-have" holiday toy. In a frantic last-minute shopping spree he is pitted against a stressed-out postal carrier, a sleazy Santa and lots of other parents. Stars Arnold Schwarzenegger. KIDS FIRST!® Adult Jurors say - Very thin, many negative messages and stereotypical behavior. The children behaved better than the adults. Special Features of DVD include interactive menus, scene selections, original theatrical trailer. Some of the language is questionable. Contains lots of action including some slapstick comedy. KIDS FIRST!® Kid Jurors say - "There's too much fighting." "Some pictures were too fake." "Little kids shouldn't see the drinking part." "The adults didn't treat each other well." Middle-class kids related best, at-risk kids didn't relate to this at all. Description - This wild holiday has many visiting celebrities stopping by to wish Pee Wee a merry Christmas. Includes Annette Funicello, Frankie Avalon, Magic Johnson, Cher, Joan Rivers, Oprah Winfrey, Whoopi Goldberg, Little Richard, k.d.lang and Zsa Zsa Gabor. KIDS FIRST!® Adult Jurors say - Pee Wee's very clever, and original approach teaches kids good social behaviors. This may be a little dated but it's still very clever. Lots of gags, though some humor may be above children's understanding. KIDS FIRST!® Kid Jurors say - Great, especially for those at the younger end of the recommended age range. Description - A wounded reindeer and a precocious eight-year-old girl form an everlasting bond in this tender holiday drama about true devotion and friendship. An enchanting film filled with heart and gumption. Description - A holiday story with a musical twist. An animated version featuring the voices of Whoopi Goldberg, Ed Asner, Michael York, Tim Curry and Jodi Benson. 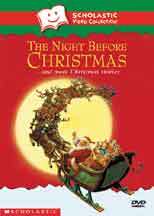 KIDS FIRST!® Adult Jurors say - Age-appropriate introduction to this classic. The vocabulary is right on target. Delivers positive messages about caring, being kind and giving. Some great songs. Animated characters are very realistic. KIDS FIRST!® Kid Jurors say - Imaginative animation. Kids really enjoyed the singing and the story. "I liked the singing and the ghosts best." Received high points from younger kids. They enjoyed the lessons about kindness and how to act toward other people.